Bluesound Powernode review | What Hi-Fi? When it comes to multi-room audio, Sonos has had the lion’s share of the market for some time, winning consumers over with its reliability, ease of use and lifestyle-led design. What it’s never been able to do, though, is scratch the itch for high-res audio so craved by the hi-fi community. The community’s response? Go and do it, itself. With its tagline of “hi-fi for the wireless generation”, Bluesound is made up of many of the same people who pioneered respected hi-fi company NAD back in the 70s. But rather than dip its toe into the market it’s taken a running leap at it, introducing five new products that offer a solution for every situation. We’re testing the Powernode here, an amplified streamer that just needs a pair of speakers and an internet connection to get going. Also in the range is the Node (unamplified, for hooking into an existing system) and the Pulse (an all-in-one speaker system), both of which act similarly to the Powernode, plus the Vault and the Duo – a 2.1 speaker package. Taking a look at its design, the Powernode is shaped like a cube off-axis, with an aluminium band going around the middle and the volume control placed on the top. The rest of the chassis is made from a choice of black or white gloss plastic, which looks nice enough but does feel a little insubstantial when you pick it up. While the Bluesound range might be aimed at people who place audio performance above all else, that doesn’t mean they’re going to put up with a clunky experience to get it, and Bluesound has worked hard at making sure that is not the case. After getting the Powernode out of the box and powering it up, the first thing to do is get it onto your home network. The quick-start guide walks you through the steps to do this, with the LED on the top-mounted mute button glowing solid blue once it’s successfully connected. It’s worth remembering that streaming high-res audio over wi-fi is pretty bandwidth-intensive and you’ll want to make sure your router and/or network is up to it. Consider hardwiring the Powernode if you have a busy network, or you may experience intermittent dropouts. The Powernode features two stereo speaker outputs and a subwoofer out, alongside an ethernet socket and A-type USB port for external hard drives or for adding a Bluetooth dongle, for example. Perhaps the only thing we’d add is a 3.5mm socket, but it’s no huge omission. You’ll need to download the app to control it whether you’re using it solo or as part of a multi-room set-up. It’s been designed with ease and simplicity in mind and is made up of three main screens – one for the menu, the second for your playlist and what’s playing, and the third for your list of Bluesound players. You simply swipe between them to get to where you want. The menu page is where you’ll find access to your local sources and streaming services; where you’ll be able to view, tweak and delete your playlists (which can be made up of tracks from wherever you please); the place to reindex your music collection when you add more to it; and all the information you need to setup and configure your player. Grouping players together to play in a multi-room setup is as simple as tapping a button on the relevant screen. This means all speakers in that group will play the same music wherever they are in the house, or you can choose to play music independently instead, and control all of it from your single device. If you have a tablet, it’s certainly worth using that where possible – it’s a much more visual experience and is better laid out thanks to the extra space a larger screen has to offer. Part of the beauty of the Bluesound system is its inclusive outlook, offering high-res music support up to 24-bit/192khz alongside a handful of the most popular streaming services, including Spotify, Rdio, Deezer, Qobuz and TuneIn Radio. It can’t quite match the 30 services currently available through Sonos, but it should cover most bases. We’d like to see Google Play Music and Napster added next, while Pandora would be a good addition for the US. 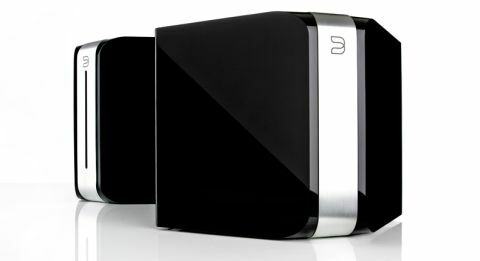 The Bluesound Vault is an all-in-one music streamer and CD ripper, offering 1TB of on-board storage and the ability to rip CDs in bit-perfect lossless FLAC without the need for a computer. It will also search out any other music stored on the network, in NAS drives or on computers, and bundle it all together with its own for seamless streaming to other Bluesound devices, or by connecting it up to an existing system via its stereo outs. There’s even the ability to bolster your high-res music collection by downloading directly from the Highresaudio online store onto the Vault’s hard drive via the app. In use, we found it to be as smooth and problem free as using the Powernode, with CDs ripping quickly and reindexing without issue. Unlike the other components in the range, it does need to be hardwired to your network at all times, though, to ensure streaming is as stable as possible. We hook up the Powernode to a pair of Q Acoustics Concept 20 speakers to get going. Using the app, the Bluesound is able to pick out our NAS drive on the same network and display its contents, artwork and all, under the local library tab. We start off with a 24-bit/96kHz resolution file of Dire Straits’ Money for Nothing. Sting’s opening falsetto vocal is portrayed with softness and subtlety, the warm electronic sequence that beds down underneath it agile and exciting in contrast. When the drums kick in they’re tight and controlled, hitting with the urgency that helps build the track up to the song’s iconic guitar riff. By the time we get there, we’re in full-on air-guitar mode. It’s lucky our listening rooms don’t have windows… Retiring our air-based instruments for a moment, we change the tempo to James Blake, and a 16-bit/44.1kHz recording of Limit To Your Love. There are stacks of detail and insight – the piano is dynamic and loaded with texture, while the stripped-back vocal is given lots of space to hang hauntingly over the top of it all. The percussion part of the track is presented with similar precision, stopping and starting with superb timing, the bass notes reaching deep and the cymbal rhythm completely free of harshness. It’s superbly balanced – there’s a slight smoothing of the treble at the top end, but it’s done in a way that never dulls the presentation. It remains exciting and enthusiastic throughout – great for lower-res recordings – but is also capable of being pensive and brooding. We change tack and opt for streaming some music via Spotify, a process that is achieved via Spotify Connect (you’ll need a premium subscription). Once you’ve added your login details within the Bluesound app, it will appear under the streaming services tab and clicking it will open the full Spotify app on your device. Going from high-res tracks to 320kbps is always going to show in the listening, but the way the Powernode has been acoustically balanced is very clever indeed. Of course there is a drop in detail and transparency, but it’s just as listenable, offering an endlessly entertaining presentation that complements its high-resolution capabilities nicely. We play N.O.R.E’s Nothin’, and the Powernode jumps to life, sounding rich and weighty, yet light enough on its feet to keep up. There’s a real warmth to the bass here, which is predictably less defined, but still punchy, with enough clarity across the frequency range to keep us from switching back to high-res immediately. The level of choice in streaming services has always been their strong point, and it works to good effect here. The Powernode is one of the most musical systems we’ve heard of this ilk, presenting itself in a very likeable manner indeed. Squeezing both streaming and amplification smarts into a box of this size is no mean feat, but to get it looking good and sounding better is even tougher. What really makes this a product to be reckoned with, though, is its user experience. The app has been well designed and carefully considered on both phone and tablet, making it simple and seamless to jump between the music on your various home network sources and your streaming service playlists. The Powernode is a superb way for hi-fi fans and audiophiles to get their high-res kicks while enjoying the flexibility of streaming services, all on a system that’s ready to go multi-room with the purchase of a second component.